Give your student a time-travelling tour of world history with these 30 brilliant lectures that cover the full story of human civilization, analyzing geography, technology, economies, social institutions, and cultural achievements. Every lecture is delivered in special period characters often invented to illustrate the life of their times. Professor Thompson speaks and acts like them. He actually becomes them! He's such an entertaining presenter that you’ll learn without knowing it. 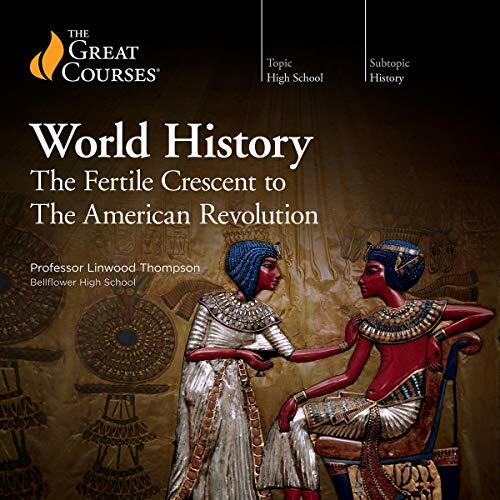 Throughout these lectures, students will discover how the Nile River and its surrounding deserts shaped the history of ancient Egypt; the importance of myths and literature, such as Homer’s Iliad, to the people of ancient Greece; how ancient, isolated, imperial China developed its unique culture; the birth of Athenian democracy; the resurrection of the humanities during the Renaissance; early America’s break from the British Empire; and more. These lectures are too good to restrict to high school students. Adults will enjoy these performances too. And history, in the hands of these many characters, has far more "sticking power" than any chronological narrative you've ever heard.